Shawn doesn't believe in monsters but he will. The real threat, however, lies in the man behind the monster, a mysterious old man who has vowed to settle an old grudge and regain something that was stolen from him decades earlier. To survive the dark days and nights ahead, Shawn must not only decipher what the man is after, he must move past his own grief, fears, and insecurities, and learn to trust in Jenny, the disgraced town sheriff, and, most importantly, in himself. 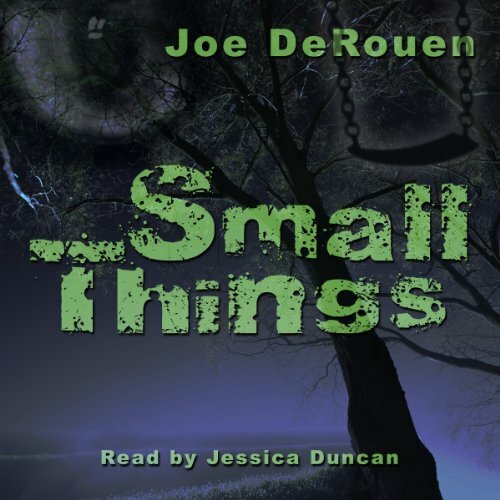 The Small Things trilogy spans forty years and three generations in a tale of murder, betrayal, corruption, sacrifice, love, redemption, faith and magic that culminates in a showdown that will pit the very forces of heaven and hell against Shawn and his family in a battle for the future of mankind and the world itself. My imagination ran as wild as the creature! What did you love best about Small Things: Volume 1? Small Things author caught my imagination and painted vivid colored pictures in my mind as I watched helpless to save anyone from what I could see coming. The story left me breathless and shocked at each turn of events! Something I simply could not turn my attention away from till the very last word! I was compelled to only think about what Shawn and Jenny were going to do next and the creature that lurked in the shadows. Entertaining, thrilling and just plan spooky. Guess the best part is it could all be true, has the author gained info we humans don't know... (Eyes checking my dark windows) All I know is I am holding my breath for the next part in the series!!! Go ahead, see what I mean, you won't be sorry!! Jenny. She was the one who had really lost more than the others but was a strong and determined to help bring her brothers killer to justice. She in a way was the under dog, the girl with the red hair and glasses, secretly had a crush on Shawn. I admire her bravery, loyalty and true young love! Have you listened to any of Jessica Duncan’s other performances before? How does this one compare? It was my first performance of hers to listen to. She did a great job of bringing the authors fantastic story of vivid images come alive in my headphones. Suspenseful, thrilling, full of magic, young love and a creature ordered to kill lurking in the shadows with razor sharp claws and teeth like knifes! I enjoyed this story so much and the experience I had with Shawn that summer. I will defiantly recommend this book to anyone wanting a good story and thrill to go along! Absolutely outstanding! I was blown away. Joe's way with words will immerse a reader into the world he has created and take them on a thrill ride they will never forget. Every time you think you have the plot figured out, buckle your seat belt and hang on, as the next twist is just ahead. Excellent as a stand alone, or you can go on to read "Threads" book 2. Move over Stephen King, there is a new Master of Horror in town! The second time around and I still like it. If you're a fan of paranormal horror, then I recommend this one.